The NewsLine: The Human vestigiality. mobility allowed to monkeys. Arrows show the vestigial structure called Darwin's tubercle. In the context of human evolution, human vestigiality involves those characters (such as organs or behaviors) occurring in the human species that are considered vestigial - in other words having lost all or most of their original function through evolution. Although structures usually called "vestigial" are largely or entirely functionless, a vestigial structure may retain lesser functions or develop minor new ones. Vestigial characteristics occur throughout nature, one example being the vestigial hind limbs of whales and snakes. Many human characteristics are also vestigial in other primates and related animals. The following characteristics have been or still are considered vestigial in humans. In 1893, Robert Wiedersheim published a book on human anatomy and its relevance to man's evolutionary history. This book contained a list of 86 human organs that he considered vestigial, or as Wiedersheim himself clarified "Organs having become wholly or in part functionless, some appearing in the Embryo alone, others present during Life constantly or inconstantly. For the greater part Organs which may be rightly termed Vestigial." This list included many of the examples on this page as well as others such as the pineal gland and the pituitary gland. Some of these organs have now had their functions elucidated; the production of melatonin and regulation of the circadian rhythm in the case of the pineal gland, and for the pituitary, the secretion of numerous hormones with roles in a wide variety of biological processes. 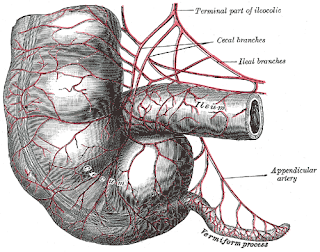 The vermiform appendix is a vestige of the cecum, an organ that would have been used to digest cellulose by humans' herbivorous ancestors. Analogous organs in other animals similar to humans continue to perform that function, whereas other meat-eating animals may have similarly diminished appendices. In line with the possibility of vestigial organs developing new functions, some research suggests that the appendix may guard against the loss of symbiotic bacteria that aid in digestion. The coccyx, or tailbone, is the remnant of a lost tail. All mammals have a tail at one point in their development; in humans, it is present for a period of 4 weeks, during stages 14 to 22 of human embryogenesis. This tail is most prominent in human embryos 31–35 days old. The tailbone, located at the end of the spine, has lost its original function in assisting balance and mobility, though it still serves some secondary functions, such as being an attachment point for muscles, which explains why it has not degraded further. In rare cases congenital defect results in a short tail-like structure being present at birth. Twenty-three cases of human babies born with such a structure have been reported in the medical literature since 1884. Wisdom teeth are vestigial third molars that human ancestors used to help in grinding down plant tissue. The common postulation is that the skulls of human ancestors had larger jaws with more teeth, which were possibly used to help chew down foliage to compensate for a lack of ability to efficiently digest the cellulose that makes up a plant cell wall. As human diet changed, a smaller jaw was selected by evolution, yet the third molars, or "wisdom teeth", still commonly develop in human mouths. In some animals the Vomeronasal organ (VNO) is part of a second, completely separate sense of smell, known as the accessory olfactory system. Many studies have been performed to find if there is an actual presence of a VNO in adult human beings. Trotier et al. estimated that around 92% of their subjects that had no septal surgery had at least one intact VNO. Kjaer and Fisher Hansen, on the other hand, stated that VNO structure disappeared during fetal development as it does for some primates. However, Smith and Bhatnagar (2000) asserted that Kjaer and Fisher Hansen simply missed the structure in older fetuses. Won (2000) found evidence of a VNO in 13 of his 22 cadavers (59.1%) and in 22 of his 78 living patients (28.2%). Given these findings, some scientists have argued that there is a VNO in adult human beings. However, most investigators have sought to identify the opening of the vomeronasal organ in humans, rather than identify the tubular epithelial structure itself. Thus it has been argued that such studies, employing macroscopic observational methods, have sometimes missed or even misidentified the vomeronasal organ. Among studies that use microanatomical methods, there is no reported evidence that human beings have active sensory neurons like those in working vomeronasal systems of other animals. Furthermore, there is no evidence to date that suggests there are nerve and axon connections between any existing sensory receptor cells that may be in the adult human VNO and the brain. Likewise, there is no evidence for any accessory olfactory bulb in adult human beings, and the key genes involved in VNO function in other mammals have pseudogeneized in human beings. Therefore, while the presence of a structure in adult human beings is debated, a review of the scientific literature by Tristram Wyatt concluded, "most in the field... are sceptical about the likelihood of a functional VNO in adult human beings on current evidence." 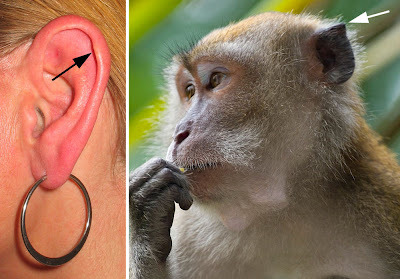 The ears of a Macaque monkey, and most other monkeys, have far more developed muscles than those of humans and therefore have the capability to move their ears to better hear potential threats. Humans and other primates such as the orangutan and chimpanzee however have ear muscles that are minimally developed and non-functional. A muscle attached to the ear that cannot move the ear, for whatever reason, can no longer be said to have any biological function. In humans there is variability in these muscles, such that some people are able to move their ears in various directions, and it has been said that it may be possible for others to gain such movement by repeated trials. In such primates the inability to move the ear is compensated mainly by the ability to turn the head on a horizontal plane, an ability which is not common to most monkeys— a function once provided by one structure is now replaced by another. 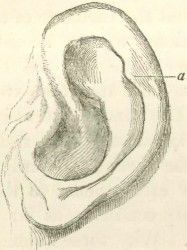 The outer structure of the ear also shows some vestigial features, such as the node or point on the helix of the ear known as Darwin's tubercle which is found in around 10% of the population, this feature is labelled (a) in the accompanying figure. The plica semilunaris is a small fold of tissue on the inside corner of the eye. It is the vestigial remnant of the nictitating membrane (the "third eyelid") which is present in other animals such as birds, reptiles, and fish. It is rare in mammals, mainly found in monotremes and marsupials. Its associated muscles are also vestigial. The plica semilunaris of Africans and Indigenous Australians are slightly larger than in other peoples. Only one species of primate, Calabar Angwantibo, is known to have a functioning nictitating membrane. A number of muscles in the human body are thought to be vestigial, either by virtue of being greatly reduced in size compared to homologous muscles in other species, by having become principally tendonous or by being highly variable in their frequency within or between populations. The Occipitalis Minor is a muscle in the back of the head which normally joins to the auricular muscles of the ear. This muscle is very sporadic in frequency - always "present" in Malays, in 56% of "blacks", 50% of Japanese, 36% of Europeans, and is "nonexistent" in the Khoikhoi people of southwestern Africa and in Melanesians. Other small muscles in the head associated with the occipital region and the post-auricular muscle complex are often variable in their frequency. In many non-human mammals the upper lip and sinus area is associated with whiskers or vibrissae which serve a sensory function. In humans these whiskers do not exist but there are still sporadic cases where elements of the associated vibrissal capsular muscles or Sinus hair muscles can be found. Based on histological studies of the upper lips of 20 cadavers Tamatsu et al. found that structures resembling such muscles were present in 35% (7/20) of their specimens. The palmaris longus muscle is seen as a small tendon between the flexor carpi radialis and the flexor carpi ulnaris, although it is not always present. The muscle is absent in about 14% of the population, however this varies greatly with ethnicity. One study has shown the prevalence of palmaris longus agenesis in 500 indian patients to be 17.2% (8% bilateral and 9.2% unilateral). The palmaris is a popular source of tendon material for grafts and this has prompted studies which have shown the absence of the palmaris does not have any appreciable effect on grip strength. The levator claviculae muscle in the posterior triangle of the neck is a supernumerary muscle present in only 2-3% of all people but nearly always present in most mammalian species, including gibbons and orangutans. The Pyramidalis muscle of the abdomen is a small and triangular muscle, anterior to the Rectus abdominis, and contained in the rectus sheath. It is absent in 20% of humans and when absent the lower end of the rectus then becomes proportionately increased in size. Anatomical studies suggest that the forces generated by the Pyramidalis muscles are relatively small. The Plantaris muscle is composed of a thin muscle belly and a long thin tendon. The muscle belly is approximately 2-4 inches long, and is absent in 7 - 10% of the human population. It has some weak functionality in moving the knee and ankle but is generally considered redundant and is often used as a source of tendon for grafts. The long, thin tendon of the plantaris is humorously called "the freshman's nerve", as it is often mistaken for a nerve by first-year medical students. Although the sense of smell or olfaction is highly important for many animals in avoiding predators, finding food, and other functions, it is far less essential to human survival, as humans have for the most part no predators, and obtain food mostly by agriculture. There is great variation in olfactory sensitivity from person to person, which is common in vestigial characteristics. It has been observed that native South Americans, American Indians, and African peoples have a highly developed sense of smell, such that they may be able to identify others in the dark by their odor alone. This does not mean that having any olfactory ability at all is vestigial, for example it may save a person from inhaling toxic fumes; however, a highly developed olfactory system seems to be of little survival value. It should be noted that a characteristic may deteriorate despite being of some use so long as there is very little or no selection pressure on the genes associated with it. In other words, having a good sense of smell may be something a person would desire, but unless those without such abilities have a lower reproductive success or fitness, there is no barrier to its degeneration. Humans also bear some vestigial behaviors and reflexes. For example, the formation of goose bumps in humans under stress is a vestigial reflex; a possible function in human evolutionary ancestors was to raise the body's hair, making the ancestor appear larger and scaring off predators. Raising the hair is also used to trap an extra layer of air, keeping an animal warm. 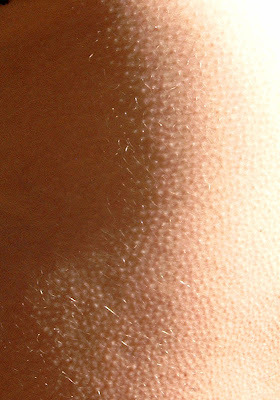 Due to the diminished amount of hair in humans, the reflex formation of goosebumps when cold is also vestigial. 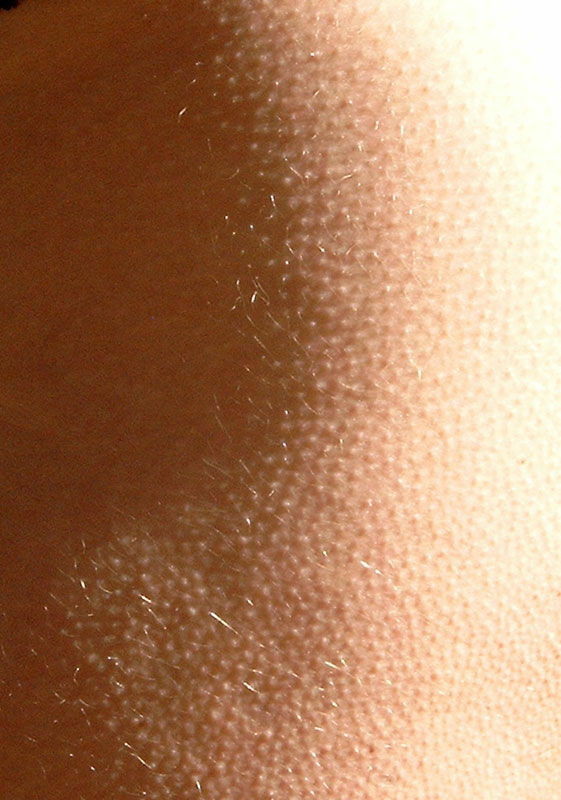 Goose bumps are an example of a vestigial human reaction to stress. The palmar grasp reflex is supported to be a vestigial behavior in human infants. When placing a finger or object to the palm of an infant, it will securely grasp it. This grasp is found to be rather strong. Some infants –37% according to a 1932 study—are able to support their own weight from a rod, although there is no way they can cling to their mother. The grasp is also evident in the feet too. When a baby is sitting down, its prehensile feet assume a curled-in posture, much like what is observed in an adult chimp. An ancestral primate would have had sufficient body hair to which an infant could cling unlike modern humans, thus allowing its mother to escape from danger, such as climbing up a tree in the presence of a predator without having to occupy her hands holding her baby. There are also vestigial molecular structures in humans, which are no longer in use but may indicate common ancestry with other species. One example of this is L-gulonolactone oxidase, a gene that is functional in most other mammals and produces an enzyme that synthesizes Vitamin C. In humans and other members of the suborder Haplorrhini, a mutation disabled the gene and made it unable to produce the enzyme. However, the remains of the gene are still present in the human genome as a vestigial genetic sequence called a pseudogene.